the geordie times online (newcastle united archive fanzine): MELTDOWN??? WILL THERE BE SHOCK 'WAVES' ON FRIDAY? 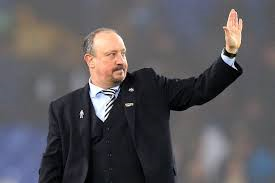 News that 'Rafa the Gaffer' iz understandably frustrated to such an extent in the never endin' NUFC transfor saga, that we 'fink' that he will quit after the January transfor window closes, IF ne new faces (loan or permanent) arrive by the Thorsday neet deadline! The Geordie Times prediction iz that Rafa will hold an unannoonced press conference on Friday and quit hiz post az he haz 'had enough'---and who can blame him? The £6 million clause in hiz contract iz now invalid and he can 'waalk away' withoot any penalty! We sincerely hope that we are WRANG and that he will stay, but we very much doubt it if ne progress iz made! NUFC are a complete shambles and yet again we are in peril of losin' anothaa great manager because of inactivity in the transfor market, with just TWO days left to get some 'bodies ower the line'! Apparently the club had asked Rafa to advice fans to renew their season tickets before the deadline, but he haz REFUSED the opportunity to do so, az he says that's "Not his business!" and that it isn't HIZ job to tell us wot to do! Ohhh! and there's the little matter of a home game against Man City tooneet, where fan protests will ne doubt reach a crescendo! Anothaa 'meltdown' chapter in the life of a shambolically run futbaall club!